SAP HANA® accelerator for SAP® Adaptive Server® Enterprise (SAP ASE) provides access to SAP HANA capabilities for advanced analytics, visualizations, and reporting to SAP ASE applications. It uses the in-memory processing engines in SAP HANA on SAP ASE transactional data for real-time analytics. Accelerator for ASE offers legacy Adaptive Server customers much more – it allows them to modernize their reporting landscape. Taking advantage of all the specialty engines that exist in HANA that are not available with traditional Adaptive Server reporting. Features like text search, geospatial and location services, predictive analytics, time series and a comprehensive analytical function library take reporting capabilities to an entirely different level. The SAP HANA accelerator adds integrated analytics to the SAP ASE database engine. With a unified installer, new analytical applications can be built on SAP HANA based on your SAP ASE data. Push down the logic to SAP HANA with minimal to no code changes while you accelerate existing SAP ASE reporting applications. Replicate SAP ASE data to SAP HANA and enable optimization using the pushdown parameter for SAP HANA, which maps SAP ASE functions, expressions, and operators to their SAP HANA equivalent. Data from SAP ASE can be accessed by SAP HANA queries and can be combined with other data in SAP HANA physical tables in views, such as analytic views, but remains in the SAP HANA data store. Review the prerequisites before you begin setting up replication for accelerator for SAP ASE. Familiarity with accelerator for SAP ASE and SAP HANA. A valid license for Replication Server with ExpressConnect for HANA DB. An installation of accelerator for SAP ASE stand-alone option. Before installing Replication Server, configure your SAP ASE server as the primary (source) database from which Replication Agent replicates transactions, and the SAP HANA database as the replicate (target) database. TCP/IP connectivity between all hosts. SAP HANA accelerator for SAP ASE requires its own license, separate from the SAP HANA license. It also requires an SAP Adaptive Server Enterprise (ASE) license. The accelerator is installed as an SAP HANA option. SAP HANA only installs on a SuSe or RedHat Linux server. 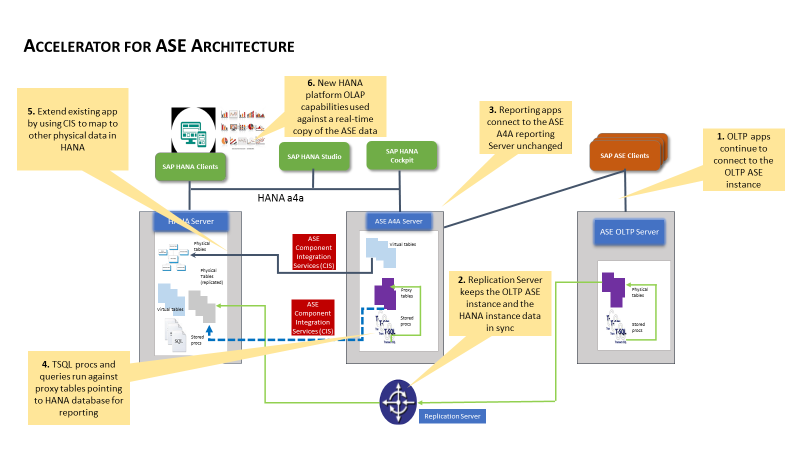 How does SAP HANA® Accelerator for SAP® ASE Work? Application users/processes continue to connect to the OLTP ASE database instance. No special connections or drivers required. Whichever connection method used before A4A still applies. SAP Replication server replicates the ASE OLTP data to the SAP HANA database. Keeping the ASE database and HANA database in sync. A second ASE server (ASE A4A Server) is used for reporting. The database schema consists of ASE Proxy Tables that reference the actual (replicated) data tables in the SAP HANA server via ASE Component Integration Services (CIS). The application TSQL procedures and queries reference the ASE Proxy tables which are mapped to the SAP HANA tables via CIS. (Optional) Extend/Enhance reporting capabilities by adding other data stores to the SAP HANA server. (Optional) Enhance OLAP capabilities by accessing the SAP HANA server directly and leveraging the full breadth of the SAP HANA Platform. To fully appreciate the value of the Accelerator for ASE solution, you need to understand the SAP HANA Platform. SAP HANA is an in-memory data platform, much more than just an in-memory database, that lets you accelerate business processes, deliver more business intelligence, and simplify your IT environment. SAP HANA transforms analytic intelligence with advanced data processing for business, text, spatial, graph, and series data in one system to gain unprecedented insight. As well as, deliver deeper insights using predictive analytics capabilities. SAP HANA is built on an in-memory columnar data store that optimizes the benefits of multicore processing and the single-instruction, multiple-data instruction set. It’s fully compliant with requirements for atomicity, consistency, isolation, and durability (the ACID standards). Intuitive modeling tools and preconfigured function libraries let you run complex business logic directly inside the database. That means you avoid latencies from moving data between the database and the application servers. Stored procedures take advantage of optimized in-memory calculation engines to run faster. SAP HANA includes native high-performance predictive algorithms and integration with Microsoft R Server to reveal meaningful patterns in data that help you create predictive models. Text search and text analysis extract meaning from semi-structured text and transform it into a data model for analysis. SAP HANA provides native support for spatial data – points, lines, and polygons – and spatial functions. Base maps in SAP HANA – with political boundaries and points of interest – help accelerate development of location-aware business applications. With HANA smart data access, you can federate queries to external data sources such as other databases, Apache Hadoop, and Apache Spark to perform queries without costly data movement. The PAM for SRS does not include HANA 2.0 as target database (only HANA 1.0 is expected). Could you please help to clarify the question ? SRS will work with HANA 2.0 and HANA 1.0…… If you look at the A4A documetation and the related roadmaps you’ll see that the solution is not limited to only HANA 1.0. There are continued improvements and enhancements planned for A4A. The future for HANA is HANA 2.0 moving forward.